MECHATEC presents a new box filling machine. 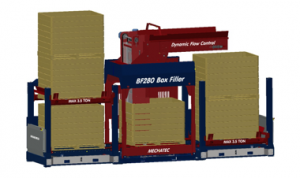 This machine the BoxFiller 280, simply named , BF 280, has been developed for handling product in the most friendly way while the capacity of handling has been enlarged. The filling machine, which is able to handle 280 m3 product pro hour is working with a surprisingly slow conveyor speed (DFC Dynamic Flow Control). This guarantees always a thick layer of product which is handled calmly. The low transport belt height can be installed either on the side or from behind the machine. He fill`s layer by layer direct into the box and creates a perfect distribution of the product and leaves good airspaces. Of course this can only be reached by using a wide down conveyor belt which creates an equal and flat filling of the box, even in all corners. Filling on level or on weight shake or not shake the box, all can easily be installed through the touchscreen. The registration of all filling can be connected to your company software. Because the weighing system is under the box you can also fill Big Bag container which is used as a box. An optimal use of the machine in your company. This machine is also suitable for filling boxes with carrots and e.g. chicory. Because all layers are shaked immediately a massive filling will be created and cooling or deepfreeze can be done in the most optimal way. This machine is available as a stand alone option but can also be connected to stackers. You will have the best machine available to work your product in the most friendly and caring way and maintaining a high capacity. Always a quiet loop with a thick product stream, thus minimizing product energy absorption. Integrated in the bottom of the shake frame. Yes only through intermediate bunker, which is processed as a box, filled on weight. Relay box for direct Conveyer belt control is optional. Boxmaster or std Alone The choice is your`s.